Texas Governor Deploys State Guard To Stave Off Obama Takeover : It's All Politics Texas' GOP governor is sending the Texas State Guard to monitor a military training exercise after right-wing militia alleged it's just a cover for the president's plan to put Texas under martial law. Texas Republican Gov. Greg Abbott ordered the Texas State Guard to monitor a joint U.S. Special Forces training taking place in Texas, prompting outrage from some in his own party. Since Gen. Sam Houston executed his famous retreat to glory to defeat the superior forces of Gen. Antonio Lopez de Santa Anna, Texas has been ground zero for military training. We have so many military bases in the Lone Star State we could practically attack Russia. So when rookie Texas Gov. Greg Abbott announced he was ordering the Texas State Guard to monitor a Navy SEAL/Green Beret joint training exercise, which was taking place in Texas and several other states, everybody here looked up from their iPhones. What? It seems there is concern among some folks that this so-called training maneuver is just a cover story. What's really going on? President Obama is about to use Special Forces to put Texas under martial law. Let's walk over by the fence where nobody can hear us, and I'll tell you the story. You see, there are these Wal-Marts in West Texas that supposedly closed for six months for "renovation." That's what they want you to believe. The truth is these Wal-Marts are going to be military guerrilla-warfare staging areas and FEMA processing camps for political prisoners. The prisoners are going to be transported by train cars that have already been equipped with shackles. Don't take my word for it. That comes directly from a Texas Ranger, who seems pretty plugged in, if you ask me. You and I both know President Obama has been waiting a long time for this, and now it's happening. It's a classic false flag operation. Don't pay any attention to the mainstream media; all they're going to do is lie and attack everyone who's trying to tell you the truth. "It is important that Texans know their safety, constitutional rights, private property rights and civil liberties will not be infringed upon." Did I mention the ISIS terrorists? They've come across the border and are going to hit soft targets all across the Southwest. They've set up camp a few miles outside of El Paso. That includes a Mexican army officer and Mexican federal police inspector. Not sure what they're doing there, but probably nothing good. That's why the Special Forces guys are here, get it? To wipe out ISIS and impose martial law. So now you know, whaddya say we get back to the party and grab another beer? It's true that the paranoid worldview of right-wing militia types has remarkable stamina. But that's not news. What is news is that there seem to be enough of them in Texas to influence the governor of the state to react — some might use the word pander — to them. That started Monday when a public briefing by the Army in Bastrop County, which is just east of Austin, got raucous. The poor U.S. Army colonel probably just thought he was going to give a regular briefing, but instead 200 patriots shouted him down, told him he was a liar and grilled him about the imminent federal takeover of Texas and subsequent imposition of martial law. "We just want to make sure our guys are trained. We want to hone our skills," Lt. Col. Mark Listoria tried to explain in vain. One wonders what Listoria was thinking to himself as he walked to his car after two hours of his life he'll never get back. God bless Texas? Maybe not. The next day Abbott decided he had to take action. He announced that he was going to ask the Texas State Guard to monitor Operation Jade Helm from start to finish. "It is important that Texans know their safety, constitutional rights, private property rights and civil liberties will not be infringed upon," Abbott said. The idea that the Yankee military can't be trusted down here has a long and rich history in Texas. But that was a while back. Abbott's proclamation that he was going to keep his eye on these Navy SEAL and Green Beret boys did rub some of our leaders the wrong way. Former Texas Lt. Gov. David Dewhurst tried to put it in perspective for outsiders when he explained, "Unfortunately, some Texans have projected their legitimate concerns about the competence and trustworthiness of President Barack Obama on these noble warriors. This must stop." Another former Republican politician was a bit more pointed. "Your letter pandering to idiots ... has left me livid," former state Rep. Todd Smith wrote Abbott. "I am horrified that I have to choose between the possibility that my Governor actually believes this stuff and the possibility that my Governor doesn't have the backbone to stand up to those who do." There's no argument that after the 2014 election, Texas politics took a further step to the right. The 84th session of the state Legislature has given ample proof of that. But the events of this last week have been an eye-opener for Texans of all political stripes. You will find the names of Texans etched into marble at war memorials from Goliad to Gettysburg, from Verdun to the Ardennes and Washington, D.C. The governor's proposition that these soldiers and sailors constitute a potential threat and need watching as they go about their duties certainly stakes out some new political ground for the leader of the Texas GOP to stand on. An earlier version of this story indicated that Gov. 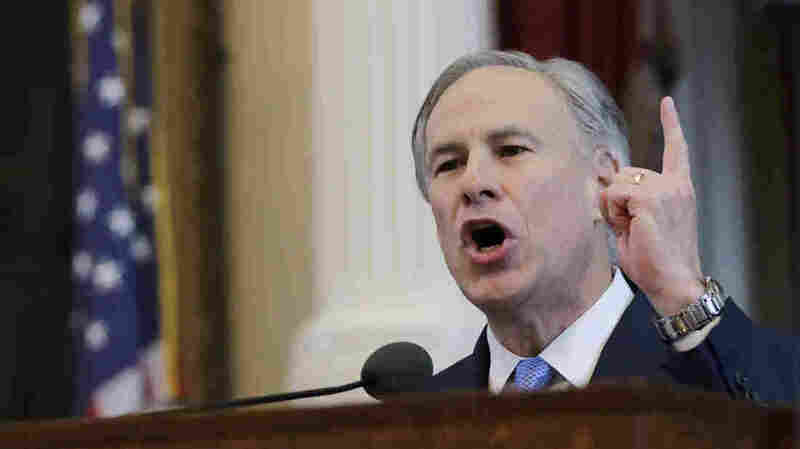 Greg Abbott had deployed the National Guard in Texas, when in fact it was the Texas State Guard.